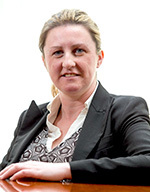 The difficulties currently faced by defined benefit schemes are well known at this stage. Low expected returns from investments and increasing annuity prices have resulted in higher contribution rates being required to fund benefits. Many employers have concluded that DB pension schemes are now unaffordable with most schemes either being closed to new entrants or, in an increasing number of cases, having benefits restructured or being wound up. One approach being adopted by an increasing number of employers is to offer their DB scheme members an attractive transfer value to encourage them to leave their defined benefit pension behind. The offer of a so-called “enhanced transfer value” (ETV) or “uplifted transfer value” requires careful deliberation by the member before electing to accept or reject the offer. Capitalised values of pension annuities can appear very large when compared to the regular pension, however, the cost of purchasing the same benefit and other ancillary benefits such as spouses pension and indexation can make these benefits almost impossible to replace outside the scheme. 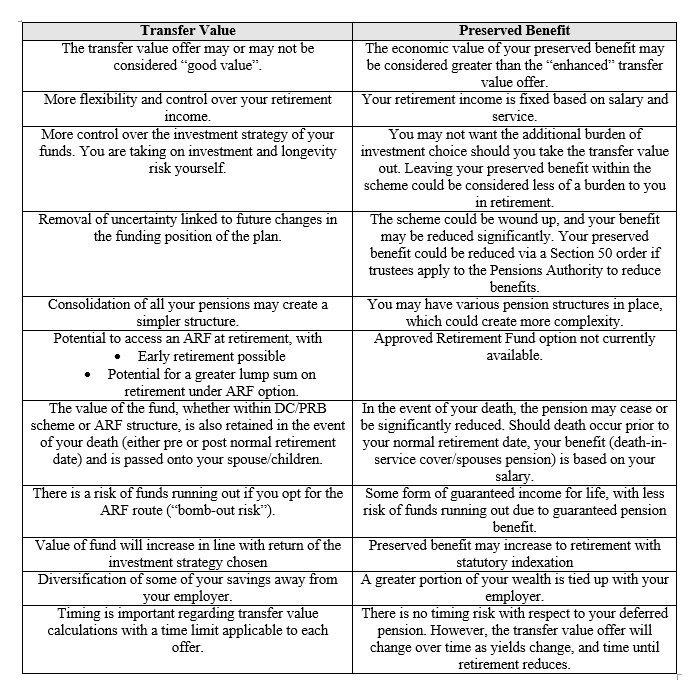 In theory the transfer value of a preserved benefit in a defined benefit scheme should be the present value of your projected future pension, with allowances for future interest rates, inflation, possible future pension increases, revaluation of pension amounts pre-retirement, and mortality assumptions. In the past, the size of transfer values on offer were similar to the economic value of the future pension, based on realistic assumptions. However, in recent years, with the decline in the funding levels of defined benefit pension schemes, transfer values payable have been reduced in value. There is a statutory basis for calculating the minimum or standard transfer value payable in lieu of a deferred pension in a defined benefit scheme, as outlined by the Pensions Authority. The assumptions that are used are set out by the Pensions Authority. Professional guidance notes issued by the Society of Actuaries in Ireland state that the minimum actuarial value must be calculated based on this statutory guidance. The standard basis has become more conservative, resulting in lower transfer value payments. Along with this, there may be a reduction in the standard transfer value payable depending on the solvency level of the scheme. As most schemes are not fully funded, this effectively means that standard transfer values are now significantly smaller than the economic value of the benefit promised at retirement. Some schemes may offer transfer values on a more generous basis, in comparison to that calculated using the standard valuation, e.g. 120% of the standard transfer value, for a limited time period. Schemes may employ this approach as a risk management tool with which to reduce long term liabilities and costs. The scheme would no longer have an obligation to pay out future pensions to deferred members electing to take the enhanced transfer value offered. Enhanced transfer values have significantly increased in popularity among DB scheme sponsors over the last year as a significant reduction in corporate bond yields has resulted in a dramatic increase in the cost of defined pension schemes as reflected in the employer’s financial statements. By offering ETV’s, the company reduces the deficit that would exist on an annuity buy-out basis. The settlement of liabilities will be recognised as an accounting gain to the company, assuming the enhanced transfer value offered is less than the IAS liability (accounting standard of calculating the present value of your deferred pension liability). It also de-risks the plan, removing some uncertainty, as well as reducing future administration costs for the scheme. The issue for the member is to assess if the enhanced transfer value offered is “good value”. The level of enhancement offered may vary. The MFS (Minimum Funding Standard) basis could be used as a benchmark on which to evaluate the level of enhancement being offered. MFS Basis – statutory minimum transfer value. IAS Basis – the value of your pension liability in the company accounts. DC SORP Basis (Defined Contribution Statement of Reasonable Projection) – a set of assumptions that would be more optimistic than MFS Basis. Ongoing Basis – based on reasonable long-term market best estimates. This chart illustrates the pension valuation varies significantly using the different bases outlined above. The uplift on the MFS Basis valuation of your transfer value would be based, amongst other factors, on the term left until your normal retirement date. The maximum uplift we would expect the company to offer you as an enhancement would be the pension valuation under the IAS accounting basis. 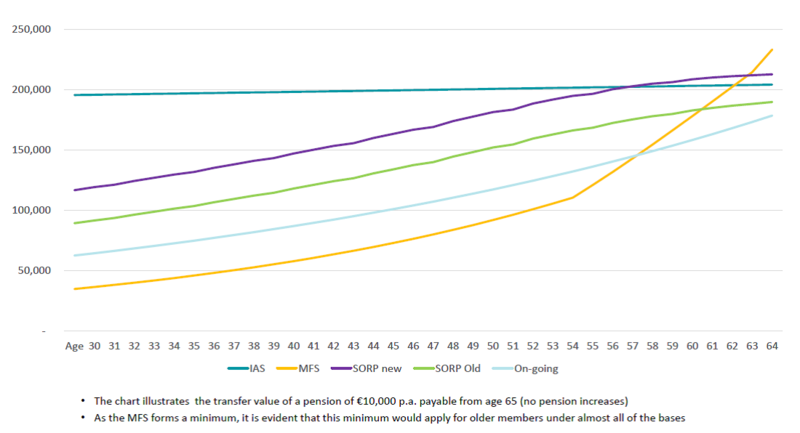 In assessing the attractiveness of an enhanced transfer value, it is appropriate to compare the offer to the estimated economic value of your preserved pension benefit. This is the pension that you would have built up to the date of leaving the Defined Benefit scheme, with service frozen in respect to your pension after this date. The economic value of your preserved pension benefit is calculated using current annuity rates and assumptions around discount factors from normal retirement date to today. It may be the case that the economic value of your pension is greater than the transfer value offer, in which instance it could be argued to keep your preserved benefit within the scheme and reject the ETV offer. Alternative option of a retirement lump sum, up to a maximum of 25% of the fund value, plus the remainder invested in a post retirement fund called an A(M)RF* which you can subsequently draw down over time as you require. An Approved Retirement Fund (ARF) is a post-retirement investment fund for monies arising from certain types of pension arrangements. It is beneficially owned by the individual but is managed by a Qualifying Fund Manager (QFM). An ARF gives effective control and ownership of the pension fund to the pension contributor in retirement. An Approved Minimum Retirement Fund (AMRF) is similar to an ARF. 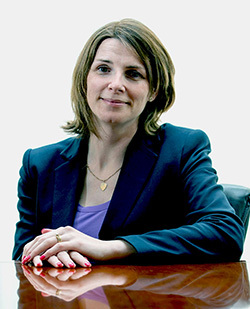 You must have a guaranteed minimum income of €12,700 per annum in order to avail of the ARF otherwise you have no choice but to invest €63,500 in the AMRF first and then the balance in an ARF. An AMRF then becomes an ARF on death or at age 75. The valuation of the pension benefit promised by a DB scheme is complex and requires that significant assumptions be made regarding the future. The offer of an enhanced transfer value to either active or deferred scheme members requires that some comparison be made between the value of the benefits being foregone and the cash transfer value put on the table by the employer. As well as the quantitative comparison of the respective cashflows out over the period to and after retirement, the different risks associated with both options also need to be understood. These risks include the long-term solvency of the scheme and the employer, the long-term commitment of the employer to the scheme and the investment risk being assumed by the member should they accept the ETV offered. We would always recommend that specialist advice be sought when assessing the various considerations around enhanced transfer values as the individual circumstances of each member will often change the recommended course of action. Wellesley Investments & Pensions has significant experience advising defined benefit pension schemes and their members in relation to transfer value options. Our in-house team includes specialist advisors in the areas of personal pension structures, actuarial, personal taxation and investment strategy. If you would like to discuss any aspect of the above note, please feel free to contact either Carmel or Ashley at the contact details below. [i] A Personal Retirement Bond also known as a Buy Out Bond, is a single premium pension plan effected by the trustees of an occupational pension scheme in the name of a member who is leaving that scheme i.e. a Personal Retirement Bond is an occupational pension arrangement in your name rather than in the name of your employer. 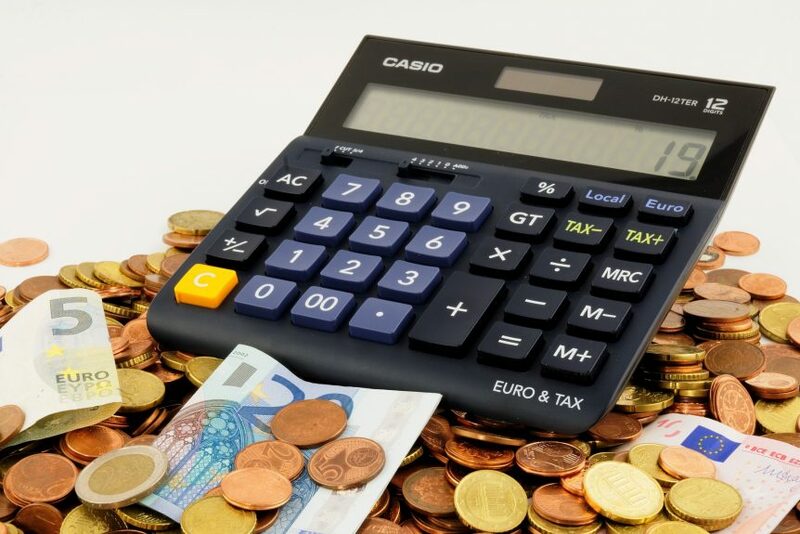 [ii] Lump Sum benefit is tax-free up to €200,000, with any amount greater than €200,000 up to €500,000 taxable at the standard rate, currently 20%. Warning: This document is for general information purposes only and does not purport to give financial advice. You should consider your own personal financial situation, objectives and particular needs before acting on any information provided in this document and seek personal financial advice if required.